The 2014 Toyota Camry continues forward with very little changed since last year. Meanwhile the 2014 Honda Accord has simply leaped ahead in technology. 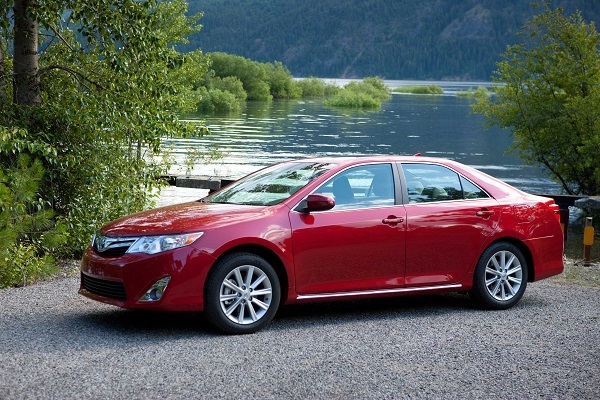 The 2014 Toyota Camry has a hard road ahead. The Camry has been the best-selling car in its class now for 15 of the past 16 years. That is very important because the car class that the Camry leads is the largest car class of all, and it has the most high quality competitors. Honda’s Accord, Ford’s Fusion, Nissan’s Altima, the all new Mazda 6, and the Volkswagen Passat are all amazingly good in every way and sell strongly for their brands. Toyota is planning big changes to the Camry, but they won’t come in the coming 15 months. Camry still has an excellent model line-up. The 2014 Camry remains one of only two automakers now that offer a V6 with a desirable 6 speed automatic transmission. Only the Accord can boast that now that the other automakers have all decided to pretend that 4 cylinder turbos get better mileage and can match the power of a V6. They cannot and they do not. Nissan does offer the Altima with a V6, but very few enthusiasts want the CVT it comes with and it is almost entirely enthusiasts that buy the few 6 cylinder cars made in this category. Camry’s real challenger in this fight is the Accord which gets better mileage, has a great new “right-sized” look, and can come in either a manual or automatic. Now that we got that out of the way, let’s look more closely at the bulk of the market, which is four cylinder cars. Here, Camry’s lack of a CVT hurts it badly in terms of fuel economy. Accord and Altima do better, and even the new Mazda 6 beats Camry. In real world driving, the difference will not be huge, but many shoppers start their search on the internet and numbers are more important now than ever. Numbers are not on the Camry’s side when it comes to fuel economy. Yes, the Camry does have rock solid quality, durability and reliability. And with two years of free maintenance, the value proposition does come down on the Camry’s side. Camry also has a huge pool of ex-Corolla owners that have had a wonderful ownership experience and want more. Bad news for eh Camry is that the new Corolla is simply huge inside, an insanely good value, and may have the edge in the looks department when the Corolla S is compared next to the Camry base L or even LE models. The Camry is keeping up inside with a very good assortment of leather, suede, and now Softex. Softex is a material for those that want a leather-like product, but not at the expense of having to take it off a living creature. Toyota is ahead of the game in this department. One can also expect a very competitive suite of navigation and entertainment options in the Camry. In terms of exterior styling the Camry is still very conservative and there are so many out there that one feels as if they look ordinary. The Kia Optima, Mazda 6, and Accord Sport models are going to cut deeply into the pool of shoppers that buy based on looks. Even the Ford Fusion and Chevy Malibu are now handsome sedans. Incredibly, the Camry is farthest behind now in the hybrid model. The new Accord simply crushes it in terms of fuel economy. The 2014 Camry effectively brings a knife to a gunfight with its 41 MPG combined. The Accord is now at 47 MPG combined. Worse news for Camry is that the Accord can achieve 50 MPG in the city. That is fully 20% better than the Camry, and even better than the Prius V. As incredible as it sounds, the Toyota needs to really step it up in the hybrid sedan department. A new Camry is coming and our off-the-record discussions with Toyota marketing people lead us to believe it will be a huge change. That will be little solace for those that want a Camry now.